Greetings in the name of the Lord. I bring blessings for all of you, my friends. Blessed is this hour. I am telling you about this not merely to give you information about the higher spheres, for that in itself would not be sufficient reason, interesting as this knowledge may be. You should always get some practical benefit out of these lectures for use in your actual life, right here and now. Since every force or principle present in the universe also penetrates each individual human soul, you will see that a benefit can be derived from this seemingly abstract piece of information. In other words, a personal connection can and should be made, for the whole universe is within you. How human beings exploit and direct these principles or forces determines their lives, their harmony, and their happiness. I have often mentioned that activity and passivity are two basic divine aspects in the universe. Now you can see that there is not just one active and one passive principle in existence, but twelve of each. For humanity the question arises when to assume an active and when a passive attitude? When should you use the free will you have been endowed with, which corresponds to activity, and when should free will not be exercised—which is a state corresponding to passivity—so that God’s will can be fulfilled? It is in these terms that you think about the matter, but herein lies a fundamental error, my friends. For it is not in the least true that you can be passive when you want to fulfill God’s will. 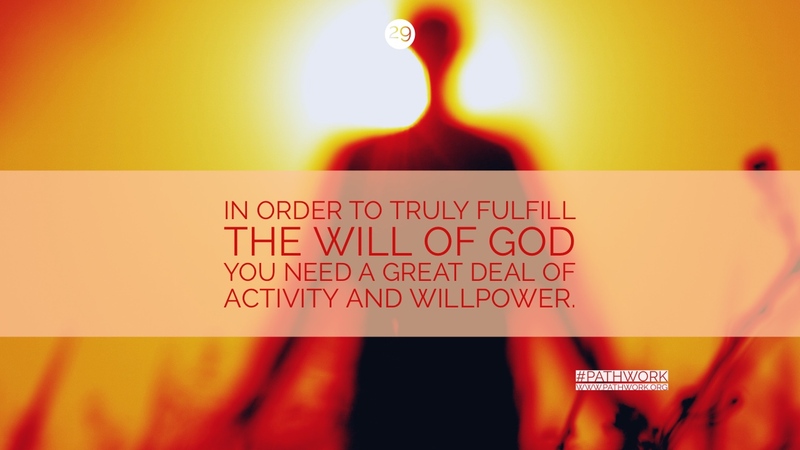 In order to truly fulfill the will of God you need a great deal of activity and willpower. When the active forces are used in the channels destined for the passive currents, a congestion occurs, and the result is frustration for the human being. If the passive forces replace the active ones, entering the channels where the active principle should work and flow freely, there will not be congestion, but rather a standstill or stagnation. The sluggishness brought about by the wrong use of the active forces will occur not only in the general development, but also in particular aspects of the human soul and gradually it will affect the entire inner makeup of the person. Any person on the path has a great need to find out in what respect the forces should be active or passive. I will try to shed light on this subject. My words will also help you to understand that passivity is not necessary to fulfill the will of God. You should at all times be active and use your willpower—which does not mean self-will, for these are two different things—to adhere to the laws of God, which you know. And that is not so difficult to find out, even for people who do not receive these particular teachings and personal guidance. People who find God in any of the current existing religions or philosophies and people who are not particularly close to God, who may be agnostics or even atheists, but who have high standards of ethics and morals, do know what is right and what is wrong if they simply face the particular issue and ask themselves honest and self-probing questions. Then they will know. In order to do just that, you certainly do need your willpower. However, where the passive forces should hold sway, and where they are unfortunately often replaced by your active forces, are all the instances in which you cannot change circumstances or other people. People are inclined to revolt inwardly when things do not go according to their will and when other people are wrong. Then an active movement begins to take the place of passivity. Whenever an emotion is felt and you follow that emotion through to its roots, you will discover that a desire is behind it. Desire means activity. You may have right desires: going on a path of purification, for example, or learning to love are such. Overcoming your weaknesses, or wanting to be honest with yourself, which causes pain at first, are other positive, constructive desires. Therefore the active force must be put in use in order to fulfill them. But there are also negative desires. Whenever resentment, fear, hatred, and the like are in your heart, there is a negative desire and therefore an active force is used instead of a passive one. Since a wrong desire cannot really be fulfilled, and if it appears to be fulfilled the fulfillment is very temporary and illusory, you become frustrated. Practically speaking, what must your attitude be like in those instances when you are supposed to be passive? You cannot change this world or other people, my friends. In your intellect you may know that very well indeed, but do your emotions always know it? Certainly not! It remains to be seen whether your emotions will or will not begin to follow what you know in your intellect. So the proper attitude would be to accept what you cannot change, namely the actions and attitudes of other people and circumstances outside your control. Accept these really and truly in your emotions as well as in your superficial knowledge, and you will rechannel the wrongly used active and passive currents. This also means to accept the imperfection of this earth sphere with humility, knowing that since you are not perfect, you cannot and must not resent others’ imperfections, even though they may be different from your own. It even means to accept your own imperfections, which does not mean that you should want to remain that way. You have to recognize your imperfections and accept for now that they actually do exist. Right now you possess many imperfections you have not yet accepted in a conscious way and therefore you revolt against this state of affairs. In the act of revolting you set an active force in motion where a passive one should exist. Only after the passive force has been cultivated can a different kind of active current be brought to bear so you can gradually begin to overcome the imperfection. As long as you revolt against things that cannot be changed, or that could only be changed by a different inner activity, there is a pressure and an inner pushing against a stone wall. As long as you do not relinquish or relax this pushing force going in the wrong direction, you cannot make order in your soul. Learn to recognize where your desires surge into wrong directions. If the active pressure of the wrong desires is relaxed, you will have much more strength left for the good and proper desires where an active force is badly needed but where you are presently too weak. Why? Not because less strength has been given to you than to other people, but because you have not managed your household well. You have allowed disorder, disorganization, and mismanagement to set in. The exactly right and necessary amount of strength is available for each one of you to fulfill your life as well as possible. It is up to you to use this strength properly and not waste it. Do not believe for one moment that those who appear weak and without will use less active force than the obviously strong and self-willed ones. Often the contrary is true. The former simply do not display their will on the surface because of other, psychologically conflicting trends. But within their soul everything sizzles under the pressure of their frustrated will that pushes in the wrong direction. They may not be consciously aware of this condition but the symptoms of their misapplied activity must show by their diminished health, strength, and peace of mind. The moment you become passive where you should actually be passive—not in your thoughts alone, deceiving yourself, but in your innermost emotions, you will have a new strength and life force that you have not known before. For this to happen you have to accept that which you cannot change immediately by direct action. So far, this may still sound confusing to you, my friends, because you do not know how to find your real feelings. Knowing how to begin is not half as difficult as you may think. The fundamental factor is again to get to know yourself, to ask yourself the pertinent questions. This is really very simple, once you decide to accept the unavoidable necessity of doing it. Each time you feel an unpleasant emotion like anger, anxiety, or resentment—and your days are often full of such emotions—stop rationalizing it away by thinking of the wrong attitudes of others. Instead, ask yourself, “What do I really want?” Know that the moment there is emotion in you, there is something you want. Otherwise you would not feel that way. I certainly do not say that all emotions are wrong, but unpleasant emotions must have a faulty premise somewhere, no matter how wrong others may be. The assumption of a faulty premise often manifests in an active pressure to change a condition or circumstance where acceptance should reign. Find out what this pressing desire is and examine it. It does take training, and forming the habit of observing yourself from this point of view, but how beneficial this way of thinking is! Once you begin and do not let up, you will see that it becomes second nature, a good habit without which you would not and should not want to live anymore. It is part of the daily cleansing of the soul. Before you start looking at yourself in this way, you are often caught up in an emotional confusion about the nature of your soul. You do not realize clearly what is going on in you, and what your desires are. Once you begin to focus your attention on the feelings, noticing what the desire is behind them, recognition becomes very simple, indeed. And that is the purpose of the daily review I mention so often. But if some of you cannot or do not like to do your discovery work in the form of daily review, there are other ways of doing it. Whenever you have a free moment, think about the past few hours and think what your feelings actually were during them or during any particular experience. Then ask yourself, “What is my desire?” And when you find the answer, you will already have a clue. The answer will often be that another person has done something wrong or what seems wrong to you and you want that person to change. There you can actually observe close at hand that where you should be passive, you are active because you actively desire a change that you cannot bring about. When these overactive desires run in the wrong channel, you completely forget those instants when you have the power to change, if you would only look at yourself. For there is so much power given to each one of you! Yet, you do not realize it. Why? Because you misdirect your power into the wrong channels and it goes to waste. You use it up unproductively. If you learn to examine yourself in this manner, you will not only find wrong and unfulfillable desires in you but conflicting desires as well. You often wish at one and the same time for two impossible things and create a short circuit within, stemming from these conflicting desires. Become aware of the paradoxical state of affairs within you. The only way you can do so is by practicing any type of daily review. Use self-honesty to examine your feelings and the desires behind them. That is the process to reach maturity, my friends. Your unconscious and often conflicting desires are always immature. You often desire the impossible, like a child; you find yourself desiring something that cannot be had, or for which you are not prepared to pay the price. The fact that you do not consider the problem from this angle, and are therefore unaware that there is a price to be paid for each desired gratification, does not alter the circumstances in the least. In your unwillingness to pay the necessary price for a desired goal, you leave the issue in the unconscious, thinking childishly to get around it. It is uncomfortable to realize and obey the laws of justice, so by leaving the issue in the unconscious you make yourself ill, not only physically, but on all levels of your existence. So, my dear friends, try to observe yourselves; identify your real desires. You will be surprised how much relief this knowledge alone will already bring you, provided you have wholeheartedly decided to do so, without any subterfuges. You will be relieved by the mere knowledge, for that will explain the mishaps of your life and will strengthen your trust in God’s justice and the wonderful order of the universe. God does not want you to be a puppet dependent on the wrong concept of divinity that makes you hold on to God’s apron strings, expecting Him to run your life for you. Then of course if your life is not what you want it to be, you can blame Him for it in some hidden way. In reality God wants you to be independent and strong, and you can only be that by following the way I am showing you. You can conduct your life satisfactorily, but He will not do it for you. He will let you run your own life, and if it becomes a mess, then it is you who must change, not others or circumstances. However, you can even control circumstances and other people the moment you start allowing your wrong overactive currents to become passive and the wrong passive currents to become active. For those purified currents will emanate from you and indirectly affect the subconscious of other people. And that effect will come back to you gradually, in the form of more truthful and harmonious interactions. Now the question of what the will of God is for you still remains open. I have said that it is not only wrong to believe that you have to be passive in order to fulfill God’s will, but it is impossible to be passive and without a will to do that. To fulfill the will of God means overcoming your inner resistances and for that you do need activity, although of a different kind, running on different tracks, so to speak. But you need activity and strength of will nevertheless. The passivity is necessary, though certainly not in order to fulfill God’s will. First of all, you confuse God’s will with self-will. Let us determine clearly what is self-will in comparison with free will. Self-will is the will of the little ego. Free will comprises everything: you can use free will for good or bad ends. That is up to you. To agree on the terminology so as not to invite any misunderstandings: self-will belongs to the little blind ego and is thus the will of the lower self. Now, in order to find God’s will, you must certainly be free of self-will, but your active and clean willpower must be used, first, for the desire to meet your resistances without any wishful thinking and self-deception; second, for making sure that you do leave your self-will aside; and third, for preparation to use your willpower even more actively to follow the will of God once you know it. To determine what the will of God is in individual instances, you very rarely need a transcendent revelation. God’s will is always contained within you, behind your blind spots. From the moment you take off your masks and the rose-colored glasses you use when you view your own self, your motives, and your life, God’s will must evolve clearly and without a doubt. It will evolve as you discover your real desires and put them down in black and white and say to yourself, “This is what I actually want when I am honest with myself.” You may be surprised how this newly-discovered inner wanting deviates from your conscious desires. But do not believe that because of this conflict you are despicable. No, you should know that your soul consists of layers which may be called the higher self and the lower self. Accept that both are in you and all will be well. Then you will not lose your sense of proportion in evaluating yourself, either exaggerating in one direction or in the other. The moment you do examine a particular desire of your lower self and bring it into your consciousness—being careful not to allow it to slip away again into unconsciousness—you will be able to know quite clearly what is God’s will in nine out of ten cases. I can promise you that. Examine the various chain reactions that led you to the present state, consider the repercussions, the significance, and the consequences of your desire and compare it with the spiritual laws as far as you know them. If you are in a certain situation now which you want to change, or face a difficult decision, you will of course not know what God’s will is if you merely let it go at that. But the moment you ask more penetrating questions of yourself concerning underlying desires that may be responsible for your present state, the answer must evolve clearly, strongly, and self-evidently. It will evolve all the quicker and better if you enlist God’s help for this purpose, because God never gives any help of this sort if you have not made the first step. The first step, in addition to your sincere goodwill to purify yourself and do God’s will in all instances, is always your endeavor toward self-knowledge, self-honesty. The wise and mature attitude, of course, is not believing that you can change from one day to another or without making an effort on your own behalf. If your present situation feels unsatisfactory in any way, or if you are not clear about a decision you are called upon to make, do not expect God to decide for you or to alter an unpleasant situation without your active participation in the process. You have to realize that there must be something in you that contributed to the undesirable circumstance to begin with and be willing to find what it is and change it. Do not forget that the wrong is not necessarily a sinful action or thought, but an unrecognized emotion that surges in a wrong channel or violates a spiritual law. God recognizes your goodwill, and if you combine prayer with the work of self-examination and tearing down your masks, His answer will become ever more clear, so that there will be no possible room for doubt in you. But as long as your resistance against this way of working persists, no matter what the pretexts and excuses are, the sluggishness and the immaturity of your lower self has the better of you. You will have wrong reactions and distorted instincts, which you will then want to interpret to fit the resistance of your lower self. The only way you can positively know whether a right and good instinct or a wrong and false one guides you is by the happiness, relief, freedom, and the sense of utter rightness and peace with the world that you will have as a result of it—or by the experience of the very opposite. If your will is free of self-pampering and is pure and humble, God’s will can clearly manifest, no matter how He chooses to reveal Himself to you. In many instances you will not need a particular revelation, but with your good efforts and God’s help enlisted in prayer, you will find out the answer for yourself. God will help you through His angels so that you can do it better and have more support from the spirit world and receive more guidance and help. You must be the one to decide, “I want to do it wholeheartedly.” Then God will help you. Then there will be no problem knowing what God’s will is for you. The answer and the key to God’s will are within you. It lies in your imperfections; it lies in every instance where you have deviated from or broken a spiritual law, be it merely in your unconscious desire-currents. And then, as you digest the answers, the active process will start functioning properly as by itself and flow into the right channels; and so will the passive forces. Yes, my friends, this change will and must happen. It cannot be otherwise. And that, of course, will change your entire life for the better. The severest and most frequent violation of spiritual law that is so often overlooked by human beings is not living in truth. You all imagine that I mean you should not lie. I do not mean that at all. It is self-understood that a person should be honest and should not lie. But lying to oneself is often infinitely more dangerous and harmful than lying to others. Why is it more dangerous? Because when you lie to others, at least you are aware of it; you know it. Thus you are a step nearer to truth than when you lie to yourself. When you lie to yourself, you do not realize it, not because you cannot, but because you do not want to! So you have completely turned away from truth. That is a very grave violation, setting you apart from God. It surrounds you with a dark wall behind which you must be unhappy, quite apart from the outer conflicts which the violation creates for you sooner or later. Behind the wall you are lonely and lost. The only way you can find your way into the light is by tearing down the wall and looking at what is behind it, even if what you find is unpleasant. The first time you will struggle, but after you have torn down the first few stones of the wall, the relief will be tremendous. Then you will know what it means to be on this path. You will know that only this manner of working and nothing else counts, my friends. I am trying to make you understand that you are not unfree creatures if you decide to fulfill the will of God—quite the contrary. For it needs the greatest and freest efforts of willpower to decide to live within spiritual law. In order to do that, as I have explained, it is necessary to recognize your innermost motives and hidden currents. Only a free person can do that. Conversely, if people constantly decide to use their little self-will, they become more and more bound and chained. For the more you live in divine law, the freer you must become, and the more you break divine law, the more enslaved you must become. People who do not recognize their hidden motives cannot conduct their lives freely. They are enslaved to their lower selves, to their unrecognized desires, which push and pull them backward and forward, left and right. QUESTION: Does that mean that whatever we want to do, we always have to ask God, “Is this Thy will?” Or do you have to see whether it does not deviate from God’s law? ANSWER: I would suggest this: In the first place, when you are on this path, you begin to make an inventory about your own person, as I have often suggested. Compile a list, not only of your faults, your qualities and virtues, in other words of what you are, but also of what you want. What are your desires really? And when you have done that, begin a constant process of self-analysis of your feelings every day. You will automatically get to know after a while in what respect you have obviously deviated from divine law in your emotional currents. Sometimes, when you discover the nature of a hidden desire, you will know at once that it is contrary to God’s will, even without any metaphysical knowledge. In other cases, you may have to probe a little deeper and separate the clean motive from the impure in the same desire current. As you view what is at stake in an issue, you will seldom find an answer by asking whether the action you contemplate is right or wrong. Since none of you would ever consider committing an antisocial or sinful act, the decisions you are faced with could be right either way in principle. Yet, for each individual there is always only one right way and many, many wrong ways possible. So you have to consider your honest motives behind your apparent good motives; that will determine the right or wrong action for you, not the ethical value of the action itself. As long as you have not found all the motives behind a desire, you will not be able to know the right action for you. The right procedure is not to ask God simply to let you know whether to do such and such, thus avoiding the work of self-knowledge on your part. There may be isolated instances where this can be the right thing to do, but not generally, not when there seems to be a repetitive pattern and a conflict involved. The right procedure is to decide wholeheartedly that you wish to find all the motives behind the conscious motive, and for that you should pray for God’s help. Then He will help you. Is that clear? ANSWER: So find out your underlying motives—which does not mean that the motive on the surface is annulled. But the other part that is mixed in with it has to be found. Then you will have the answer. There is one more thing I would like to say to you before we turn to your general questions. It is about the outer will and the inner will. By the latter I do not only mean the subconscious will. The inner will I speak of can be made conscious comparatively easily. I have often given you the advice to listen within you where your solar plexus or spiritual field is. You may receive answers from there; you may feel right or wrong from this part of yourself, provided you have once wholeheartedly decided for the right course and that the resistance and fight are over and done with. If you become very quiet and relaxed and listen within, you may find that there is another will coming from there, or you may feel the lack of it, for that matter. This will or its absence often conflicts with your outer or conscious will. Let us suppose a person sincerely desires to love a fellow-creature and desires to do so because he knows that it is right. This desire is in the person’s outer will. After becoming quiet and consulting the inner will, the person will find out that the inner will does not conform with the outer one. To find out such a discrepancy is extremely important, for how can you control yourself if you do not know what is within you? By controlling yourself, I certainly do not mean suppressing anything, but rather holding life’s reins firmly in one’s hands. How can you cure a wrong current if you do not discover it first? If the inner will is right, it exists very quietly from deep within and yet is conscious. Now, if people desire to do their best, to fulfill their tasks as well as they are able to or to overcome their faults as well as possible at the present stage, their inner will should be directed toward that end, without pressure, without haste. The outer will does not press but is relaxed. A pressure from the outer will must make a person tense and will only delay the process. The inner will must want the right thing and the ultimate goal. The outer will must be serene and give leeway for life’s hindrances and imperfections that make it impossible to proceed speedily and according to a certain plan. The apparent obstacles should be met voluntarily as a means of growing faster, of learning to accept that which cannot be altered by the self, of learning humility, and other positive attitudes. Then the obstacles will cease to be obstacles and will instead become stepping stones on the way to the goal. The outer will must be flexible; it must be prepared for change. Sometimes it has to become more active, so you can act. At other times it has to become more passive. The inner will has to be active, but quietly, as befits the whole foundation of the person’s life. To understand these words truly, meditate about them deeply and perhaps quite often. And now we turn to your other questions. QUESTION: In the case of war, is the act of killing by a soldier contrary to divine law? ANSWER: No, it is not. For as Jesus Christ has said, render unto God what is God’s and render unto Caesar that which is due to him. If human beings on the earth sphere are still so far behind in development that war is necessary, then people have to fight for their country. Even if all people refused to fight, evil would not be eliminated. War may be temporarily eliminated, but certainly not evil. War is only one of many other expressions of evil. War is not the cause: it is only an effect. It would be the same if a father allowed a murderer to come into his house and kill his wife and children without defending them. He must defend those he loves and evil has to be fought against. In your present state of development, unfortunately, war often is still your means of fighting evil. As spiritual development grows, you will learn to go more to the roots of the problems and fight against evil in better ways. As it stands now, humanity is often forced to battle against forces that abuse free will and divine law. If people take the power upon themselves to prevent other people from living as God wants them to live, and if your world has not found other means as yet to eliminate this wrong, then war is the lesser evil. You know from the spiritual point of view that death is not the worst thing that can happen. Spiritual death is the worst, not physical death. Every person is judged individually, and the judgement comprises also the circumstances and the environment in which he or she lives. In the spirit world, the real motives count more than the act, and judgment is not passed generally or collectively. Everyone is judged separately, and if a man goes to war simply to defend his country, this will not count against him. What counts is a person’s inner attitudes, feelings, reactions, motives, and sense of responsibility. QUESTION: How does spiritual law correspond with human law in the case of a death sentence for a murderer? ANSWER: From the spiritual point of view, capital punishment is wrong. That may sound like a contradiction when compared with the last answer, but it is not. In the case of war, it is a question of defending a nation and humanity. For humanity, war is often the last resort. And even the people living in the aggressor nation are often convinced that they are only doing their duty; they do not see the whole picture. They have to abide by the laws of their society. Otherwise they might cause more hardship, not only to themselves, thereby becoming incapable of fulfilling their lives, but also to others around them. Again, we cannot generalize, for there may be instances when it is the duty of a person to violate a human law in order to fulfill a law of God. But these instances are rare and only expected of strong and highly developed beings sent to earth with a special mission. In general, this does not hold true. Capital punishment is not a necessity. However, war often is in your present state of development. You have not yet found the way to eliminate war. The only way to do so is when resentment, hate, and fear do not live in the individual soul any more. That is the only basis for peace. But capital punishment is not necessary. QUESTION: You said in my private session to bring up this question: What are the various aspects of love? ANSWER: There are many and I cannot attempt to enumerate all of them. I will just name a few: compassion, pity, respect, admiration, tenderness, protectiveness, helpfulness, kindness, truth. Yes, my friends, without truth, there can be no love! This will suffice for the moment. QUESTION: A seeming unproductivity in your life; is that possibly a stage, or an indication that you are going in the wrong direction? ANSWER: It often is an indication that you are going in the wrong direction. It might also be that in certain circumstances your will is counteracted by unconscious conflicting desires, or by fear. As long as this reality is not brought into consciousness, you cannot handle it properly. So the only course to take is the one I advocate. Of course, I am speaking generally. I have no right to give you the answer. It would weaken you. It will serve your development to find out for yourself. And you can quite easily do that with the guidance of my teachings. Actually, the two possibilities you mentioned form a whole. As long as there is conflict within you about a direction of your life, you cannot be successful in the field you have chosen. You can only be successful in anything when there is no conflict within you. And spontaneously, when you have solved the conflict between your conscious desires and the unconscious ones, you will find out what the right direction is for you. Then your desires may change. Find out the real motives behind your present desires, and find out what holds you back. Is it a fear or a desire to not pay the price wholeheartedly—which is not necessarily bad, and it may be good. For, spiritually speaking, the price is sometimes too high. At times it is the lower self that prevents success in a certain direction, and sometimes it is the higher self which recognizes that this is not good, so it prevents you from achieving success. You can find the answer by testing your motives without any self-pampering or sensitivity for your ego, with utter and shattering self-honesty. That is the only procedure that I cannot advise strongly enough, even at the risk of boring you, my friends. QUESTION: When you say an incarnation has taken place in a certain country, does that mean where a person was born even if he or she has only lived there for a very short time, or does it mean where one has spent most of one’s life? ANSWER: Most of one’s life. It would be where your roots are; it would be the country you consider your home, where you have made your connections, your ties, and your karmic links. QUESTION: This does not correspond to astrology? ANSWER: In astrology the situation is different because the astrological chart has to be figured according to the geographical part of the world. That is something different. QUESTION: A question in connection with war and killing: How are we to regard a conscientious objector who sincerely follows the admonition not to kill and considers the whole of the universe as his fellow-men rather than only the part he is called upon to defend? ANSWER: In the first place, a man is not defending a part of geography but his immediate fellow-creatures. By refusing to go to war, he may in the long run cause more harm than good. With this I certainly do not wish to give the impression that I advocate war. By no means. But war cannot be eliminated by refusing it. This cancer has to be treated in another way and slowly has to cease in all individuals. A conscientious objector, provided his motives are pure, will be judged accordingly. Then this will certainly not be held against him, the same as killing in a war by a soldier will not be held against him, if his heart is pure and his conviction sincere. But that does not alter the fact that his judgment is wrong. More precisely, his goal or endeavor is a good one, just as the goal of a sincere soldier may be a good one, but he selects the wrong means to oust an evil. Refusing to go to war could not be the right curative means against war. For as long as there is hatred within the individual soul, and as long as there is blindness caused through lack of self-knowledge, and as long as people do not purify themselves and strive upward to God, and as long as people cannot refine their feelings, there cannot be peace. It is impossible. War is an outpicturing of what goes on in so many individual personalities. It cannot be eliminated by collective means alone, well meant as they may be, unless they are supported by the right spiritual attitudes. The cure has to start from within by each individual. Otherwise you will only succeed in eliminating one effect, and another symptom will come. It is just the same with disease, my friends. War is nothing else but a disease. Your human history and your human science show you how many ways medicine has found to eliminate disease. Many diseases that existed a relatively very short time ago are not possible anymore. But other diseases have sprung up that you cannot cure, and new diseases will continue to do so until a greater degree of purification exists on this earth, no matter what wonderful progress science and medicine make. As long as the disease is not cured from within, war or other diseases will exist. If it is not war, it will be something else equally terrible. In the case of an individual, it is possible to make a mistake in judgment and this in itself is not held against you as long as you are sincere and do not delude yourself and color your motives. You all make mistakes in judgment. People have very firm opinions about any subject from religion to politics. The moment these opinions are fanatical and inflexible, people should test their real inner motives and then they may find out that these opinions are not as objective as they may have thought at first. If you dig deeply and honestly, you will be surprised how often you find a personal, emotional, subjective reason behind your convictions. QUESTION: What is the opposite aspect of vanity? ANSWER: Love and humility. For if you are vain, you want to place your ego in the first row. You want admiration—I am not speaking personally now—and you want to be more than the other person. So, my friends, God’s blessing is given to you. God’s love is streaming to you. May the words I have given you bear fruit and help you on your path and strengthen you. Be in peace, be in love, be in God!